Female Police Officer To Caroline Mwatha: A Human Rights Activist But You Kill An Innocent Child? Home / Caroline Mwatha Ochieng / Dandora / Hessy / Murder / Police / Security / Female Police Officer To Caroline Mwatha: A Human Rights Activist But You Kill An Innocent Child? A person who social media users claim is a police officer operating in the Eastlands area of Nairobi who goes by the undercover name of Blackest Widow on Nairobi Crime Free did not have any kind words for now deceased Caroline Mwatha who was discovered at City Mortuary by investigators earlier today. Blackest Widow wondered loudly how someone could call themselves a human rights activist but still go ahead to procure an abortion. 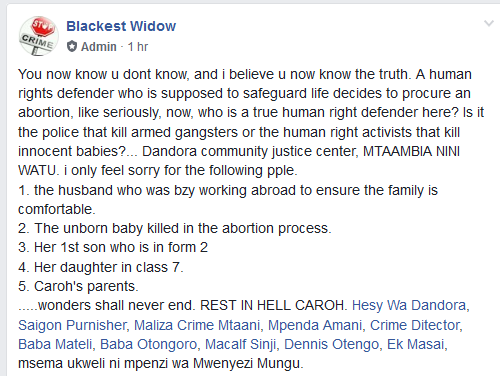 Here is the statement made by the Blackest Widow. You now know u dont know, and i believe u now know the truth. A human rights defender who is supposed to safeguard life decides to procure an abortion, like seriously, now, who is a true human right defender here? Is it the police that kill armed gangsters or the human right activists that kill innocent babies?... Dandora community justice center, MTAAMBIA NINI WATU. i only feel sorry for the following pple. 1. the husband who was bzy working abroad to ensure the family is comfortable. 2. The unborn baby killed in the abortion process. 4. Her daughter in class 7. .....wonders shall never end. REST IN HELL CAROH. Hesy Wa Dandora, Saigon Purnisher, Maliza Crime Mtaani, Mpenda Amani, Crime Ditector, Baba Mateli, Baba Otongoro, Macalf Sinji, Dennis Otengo, Ek Masai, msema ukweli ni mpenzi wa Mwenyezi Mungu. 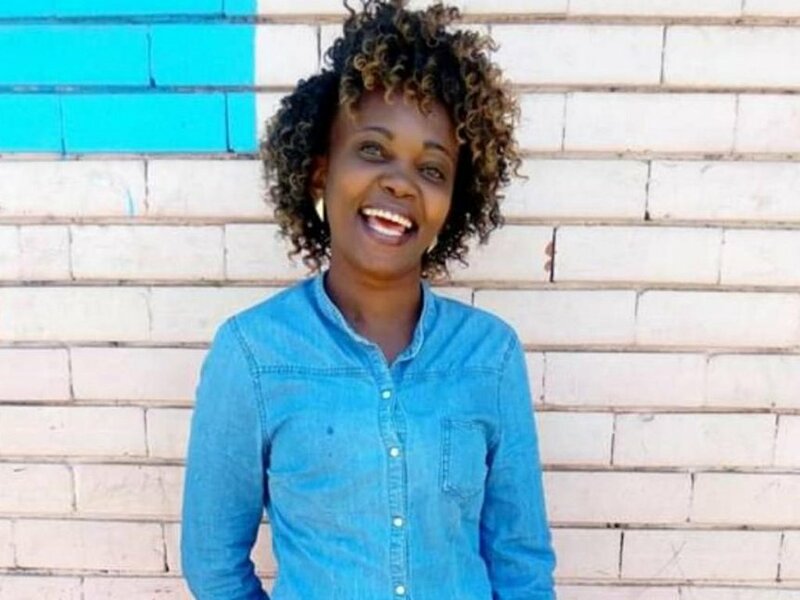 A police statement released today alluded to the fact that Caroline Mwatha had died in the process of procuring an abortion.